Activated Carbon Filtration | H-Series | General Carbon Corp.
General Carbon H-Series odor control vessels are specifically designed for controlling vapor phase H2S (hydrogen sulfide) odors at lift stations. These up-flow vessels contain a specially formulated non-impregnated H2S specific media that effectively removes H2S as well as other organic mercaptan odors. Our H2S specific media has an H2S removal capacity 4 to 5 times greater than the virgin carbon media many other manufacturers utilize. Our H2S specific media provides substantial operating cost savings compared to standard virgin carbon. The odor control vessels are constructed of UV and corrosion resistance cross-linked high density polyethylene. A raised plenum air distribution system is utilized and provides even air distribution through the media with low head loss. H-Series lids are raised 1/2″ which provides a 360 degree outlet vent with a low profile. This lower profile eliminates the need for unsightly vent stacks. 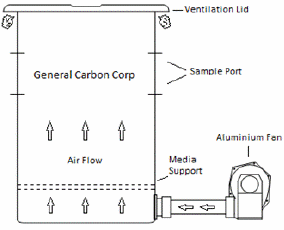 Vessels have air sampling ports for determining remaining media life. Units are provided with a quiet, corrosion resistant, cast aluminum blower with a 2 HP wash-down duty stainless steel motor. Media replacement is simple, usually requiring less than an hour. Other Available Options: We provide a complete selection of NEMA rated motors and accessories that are prewired and skid mounted. Our fans can be accommodated for your specific flow rate and static pressure requirement. We also can provide custom designs containing alarm warning devices, explosion proof components, FRP fans and skids, and air pressure gauges. Special impregnated carbons are available for problematic chemicals. We also have the equipment and trained technicians needed for onsite media change-outs.